Founded by Larry Ellison in 1977, Oracle (ORCL) is one of the world's leading IT software companies. The business serves the needs of over 400,000 companies companies, both large and small, in about 175 countries around the globe. Historically, Oracle has dominated enterprise level database software with about 40% market share. In this business, corporate IT departments license Oracle's software to allow their in-house IT departments to store, retrieve, and manipulate all sorts of data. Approximately 66% of Oracle's revenue is derived from this legacy business. Oracle also has a fast growing cloud-based data business, which accounts for 16% of sales, as well as hardware and service (maintenance) businesses which account for 10% and 8% of revenue, respectively. Many companies in the IT software industry are known for their wide moats and first-mover advantages. Not surprisingly, Oracle, who pioneered in-house database software solutions, continues to be the world leader in its legacy business. The key advantage to Oracle's legacy database business is that IT departments are very slow to change vendors due to the complex and disruptive hassle that comes with changing a firm's IT database. Meanwhile, Oracle offers customers recurring maintenance and support services that cost over 20% of the price they paid for their on-premise software license. As a result, Oracle enjoys a sticky ecosystem where high switching costs allow it to command strong pricing power and generate gobs of recurring revenue. Thanks to these advantages and Oracle's massive scale (software sales have very high incremental margins), the firm generates an impressive operating margin near 30% and throws off excellent free cash flow each year. The company's biggest priority with its R&D budget is to aggressively push its cloud computing business, which is a departure from the company's legacy core business. Oracle's historical strength has been in designing, building, and maintaining on-site database systems for IT departments. On-premise software and supporting hardware allowed companies to maintain control over their IT systems, while still outsourcing the hardest parts needed to create an efficient method of running their accounting, HR, and other departments. However, that business model was ideally suited to a more centralized world in which personal computers (mostly stored at the company itself) were the dominant form of computing. Since the late 2000's, the rise of mobile, including smartphones and tablets, has shifted Oracle's customers' needs to require more offsite flexibility. And going forward, the so-called "Internet of Things" (IoT) will see companies connecting billions of devices to the internet to gather massive quantities of data to be analyzed by artificial intelligence systems. The basic promise of IoT is that machine-adapted learning will be able to sort through massive troves of data to optimize how all sorts of companies can better run their businesses. This means that tech companies will be able to sell software-as-a-service to what were previously considered low-tech industries such as: industrials, oil companies, transportation and logistics firms, and even consumer goods makers. To put it another way, a highly automated future optimizing every aspect of a company's supply chain, logistics, and manufacturing will create a brave new world. Rather than selling one-time hardware and software systems, tech companies will increasingly make their money through a subscription model designed to maximize a customer's operational efficiency and profitability. To capitalize on this secular trend, Oracle is most focused on what it calls platforms and software as a service, or PaaS and SaaS. These systems allow Oracle to store and manage a customer's IT data at its own offsite facilities which saves its customers over 30% compared to operating the same services on site. Cloud computing is a fast growing (17% per year) market that analyst firm Gartner estimates will become a $412 billion business by 2020. Oracle co-CEO Mark Hurd believes that SaaS is the company's strongest growth driver. In fact, he recently told analysts that just 15% of the company's legacy database customers have migrated to this high-margin platform, which indicates plenty of growth runway ahead. As you can see below, Oracle's cloud business has increased from 4% of total revenue in fiscal 2014 to approximately 15% today as its traditional software customers transition to the cloud. To help augment this growth and expand its array of database services, Oracle has been utilizing acquisitions, such as its $10.3 billion purchase of PeopleSoft, a provider of human resource management systems, in 2014. The company is also aggressive in making bolt-on acquisitions, buying 48 smaller companies over the past five years. To win as much market share as possible in cloud computing, Oracle is also attempting to maintain a competitive lead in software development by maintaining a large and diverse a network of global software developers. After all, the future of its business will not be hardware focused but software based. In other words, data analysis and advanced application software will be keys to maintaining a competitive advantage. This is why Oracle has been partnering with lots of global startups in the U.S., Europe, China, and India. All told, the company has nearly 500,000 software developers writing applications for its software and cloud computing platforms. In essence, Oracle has learned from the success of Apple (AAPL), Alphabet (GOOG) and Microsoft (MSFT). For example, Apple was the first mover in PCs in the 1980's and got off to a quick lead by offering industry leading technology and an intuitive consumer experience. However, the company's stubborn demand to control every aspect of its hardware and software development meant that Microsoft's Windows, which was licensed to anyone who wanted it, ended up winning 90% global market share and making Macs into a relatively niche product at the time. The same was true in mobile where Apple's app store started out only offering Apple-designed applications for iPhones. However, Alphabet's Android took a much more open approach by allowing anyone to develop apps for Android phones. This resulted in a much faster growing and more dynamic app store. Apple quickly realized its mistake and also opened up its app store to third party developers. 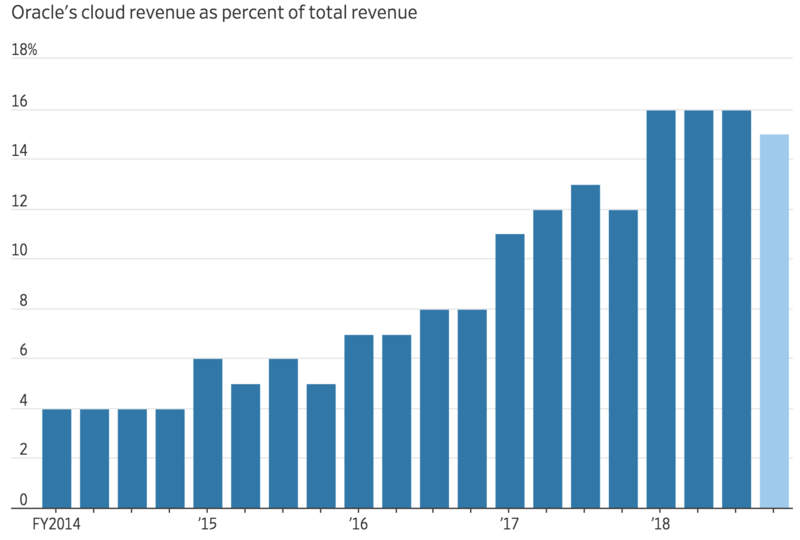 That quick pivot to embrace third party developers and outsource new app ideas is largely why Apple's services business, which monetizes its installed mobile base of over 1 billion global devices, is on track to generate $50 billion in sales by 2020. Oracle also wants to avoid the mistakes of trying to micromanage innovation, because it knows that it faces numerous rivals, large and small. All of its competitors are in the race to carve out as much market share as they can in one of the most important industries of the future. Overall, Oracle seems likely to remain a force in the technology sector. The company's massive installed base of mission-critical business software continues generating gobs of cash flow, and management is working as fast as they can to adapt Oracle's model to the cloud. However, while Oracle's cloud-focused strategy appears to be a good one, there are still risks to its ability to retain its status as a leader in the cloud-dominated world of tomorrow. While Oracle was the first mover in its industry back in the late 1990's, the company was slow to recognize the cloud computing revolution. In fact, founder Larry Ellison spent many years criticizing cloud computing and claiming it wasn't the future of the industry. Oracle is still a leader in cloud-based applications and analytics tools (SaaS and PaaS), but the company fell far behind in cloud infrastructure, which essentially lets businesses rent online storage for their computing needs instead of operate their own on-site servers. Amazon's (AMZN) Amazon Web Services was the first major cloud computing platform and has become the industry leader. Amazon's success has resulted in numerous other major tech rivals jumping into the field ahead of Oracle including Alphabet and Microsoft. Per Gartner, the data below shows just how far behind Oracle is in the cloud infrastructure market. Oracle announced plans in February 2018 to build 12 new data centers over the next two years to quadruple its cloud infrastructure footprint. However, it remains to be seen if this significant spending (likely several billion dollars) will prove to be a wise capital allocation decision in this cutthroat industry. The good news is that most of Oracle's legacy customers have yet to move their database systems to the cloud, perhaps providing Oracle with inside edge to win their business. Either way, when combined with the ongoing transition of its legacy software customers to the cloud, Oracle will have its work cut out for it as it competes with numerous rivals of all sizes. 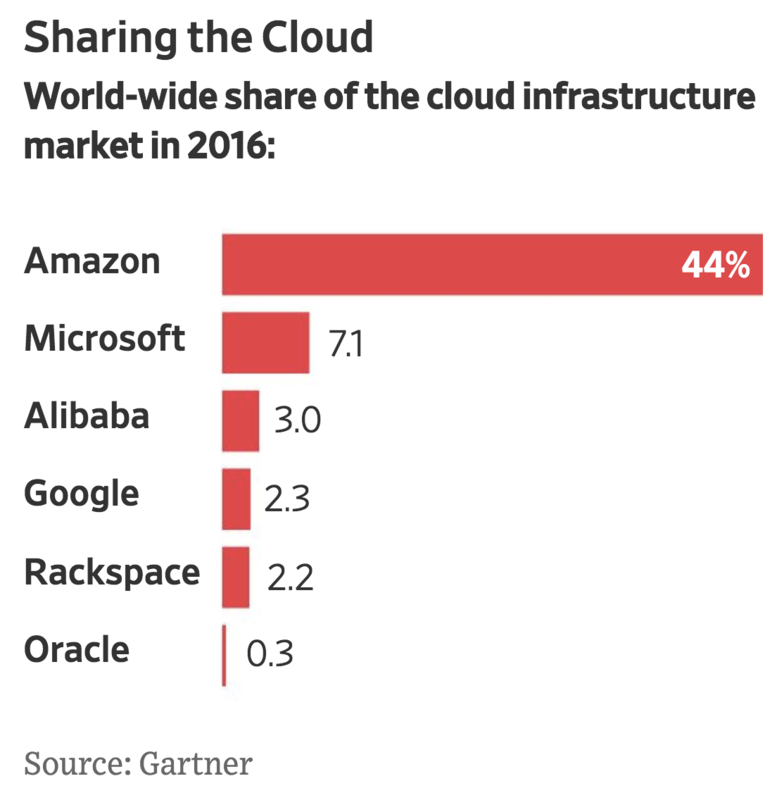 The large early movers, especially Amazon and Microsoft, have also created wide moats around their cloud businesses. Besides greater scale and presumably lower costs that come with it, these major cloud players offer far more than off-site data storage and computing power. For example, Amazon's Neptune Platform and RedShift database offer advanced AI data analysis and a suite of integrated applications to meet the needs of each individual business that subscribes to Amazon Web Services. In other words, Amazon wants to create a one-stop shop for all of a customer's IT and data needs. Microsoft's Azure cloud computing platform is similarly integrated with its enterprise Windows 365 offerings, as well as LinkedIn which it bought in 2016. In 2017, Oracle unveiled its second generation cloud computing offerings which it claims is superior to Amazon's RedShift database offerings. According to management, Oracle's cloud computing services (which it calls Fusion Cloud) will be over 100 times faster at analyzing data, over 100 times more reliable, and be priced less than 50% of Amazon's prices. While that sounds impressive if Oracle can deliver, getting into a price war with industry leaders like Amazon, who are historically more interested in market share than profits, is probably not a good way to maintain high margins over time. It's too early to say how Oracle's cloud computing efforts will ultimately pan out, especially given its increasing investments in cloud infrastructure over the next two years. However, the firm's growth rate in cloud infrastructure has lagged its peers' thus far, partially explaining why the company's forward P/E ratio is at a discount to the broader market's. Fortunately, cloud computing isn't just infrastructure-as-a-service (IaaS), but also SaaS where Oracle is mostly focused. However, the company's overall growth rate is likely to weighed down by its declining hardware and on-premise maintenance businesses as customers continue transitioning to the cloud. As a result, sales, earnings, and cash flow growth could remain tepid during this transitional period. Investors could grow impatient waiting for stronger growth rates to appear, even if these actions are in Oracle's best long-term interests. Should Oracle experience a slowdown in its cloud businesses or face contracting margins as competition intensifies and necessary growth investments ramp up, the stock could come under pressure. Finally, investors should note that Oracle's growth strategy has also been very dependent on acquisitions over the years. Not only can a cash-rich tech company like Oracle easily overpay for a deal, but integrating those software features into its system can represent a major challenge given all of the software code involved. All told, analysts expect Oracle to grow its earnings at a mid to upper single-digit pace over the long term. The company's legacy software business remains a cash cow, and Oracle's positioning in the cloud market could improve as more of its customers make the transition. When combined with the company's net cash position and relatively low payout ratio, its dividend could enjoy strong growth over time as well (management last raised the payout by 27% in early 2017). Oracle became a dominant leader in IT database services thanks to its innovative CEO who saw the promise of how technology could change the way businesses were run. While Oracle still maintains the world's leading market share in its legacy on-site database business, the future of the IT industry rests firmly in the cloud. Oracle was late to realize the cloud was here to stay, which has put the firm at a competitive disadvantage in certain areas such as cloud infrastructure. However, the company is still one of the largest enterprise software-as-a-service vendors in the world with numerous fast-growing applications built for the cloud. The stock's discounted valuation multiple reflects investors' concerns over Oracle's long-term growth rate and profitability, but the company appears to have the financial resources, cash flow generation, and unique assets needed to continue gradually adapting.